I received compensation for my work on this campaign. This post was made possible by Mom Spark Media. All thoughts are my own. 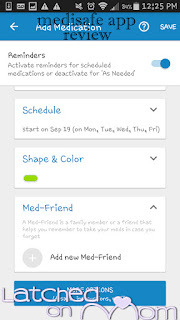 Medisafe is an app found in both Google Play and in the App Store to help you manage all your medications. Medisafe is way more than a pill organizer, this app gives you a more simple way to adhere to the most complicated medication schedule. 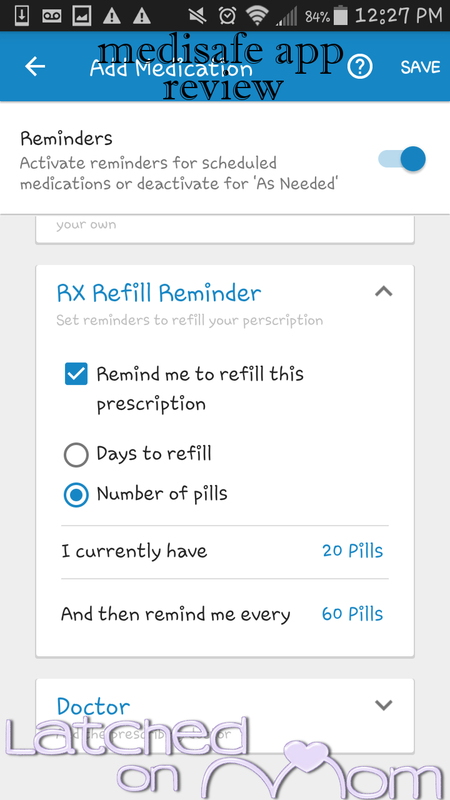 My son takes medication for his ADHD, and since we've started using the Medisafe app, “Did you take your medication already?” hasn't needed to be asked once. The "medtone" goes off marking time to take meds in the morning and we know it means business. You just hold down the TAKEN button and it's recorded in the app as taken, no more confusion or hassle! You will find Medisafe a way to help you stay connected to you to your family (and soon, your doctors) for support, encouragement and expertise. Medisafe will deliver custom notifications for appointments and refills, medication updates, personalized health recommendations and discounts to help you stay in control, informed and on budget. It also correlates your progress with measurements like blood pressure and glucose levels to show the direct health benefit of taking meds as prescribed. 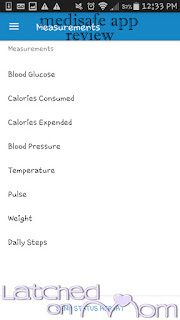 This app was created by two brothers who wanted to help their diabetic father manage his health and medications better. 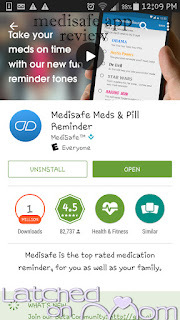 Take a moment to read the family story behind Medisafe and learn about the mission to make Medisafe the leading health app to help you stay on top of your medications and well being! No wonder there are 2 million people who use Medisafe! 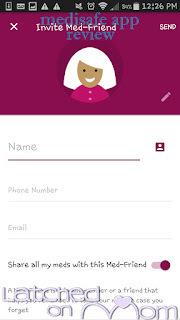 This app brings peace of mind to those who use it, as well as to those who care about them. 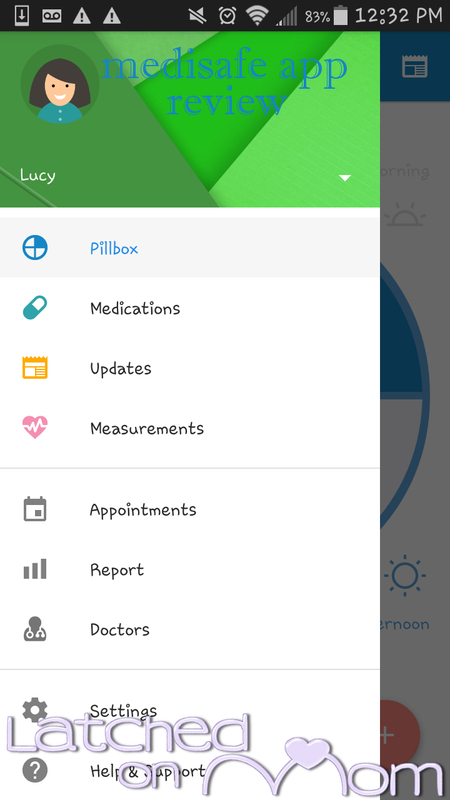 Medisafe is an all-encompasing app for those who want a better way to track their medications. I took some screenshots to show you how smoothly it works. I think this app is great, and will be using it for years to come. I have a Samsung S3 and went to Google Play to download, then click the green OPEN button after installation. The next screen will prompt you to sign in. Click the START NOW button. Enter your email and choose your password at this time. If you were provided a code from someone who invited you to use the app, you can also enter that at this time. I do not have screenshots or further information from this point of view, however. Next, you will be placed into your pillbox. In the top left corner, you'll see three lines, this is to get you to the MENU. Click it. 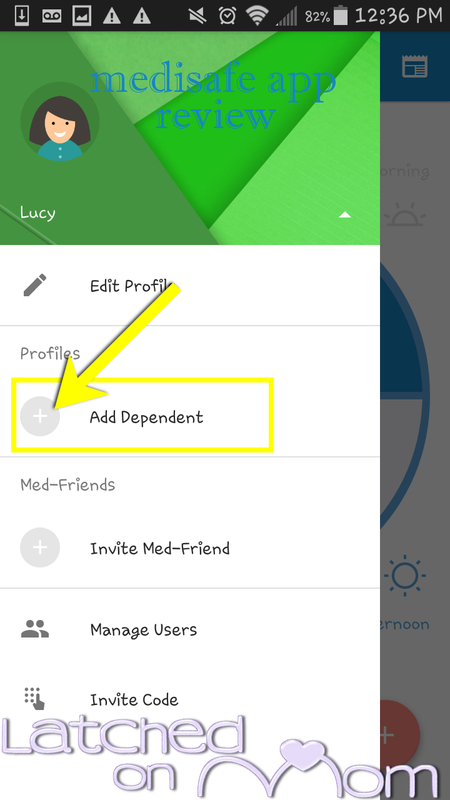 If you are adding a child/dependent to your profile, click on SETTINGS in the menu. 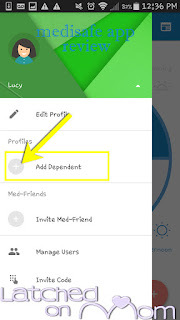 Click ADD DEPENDENT. 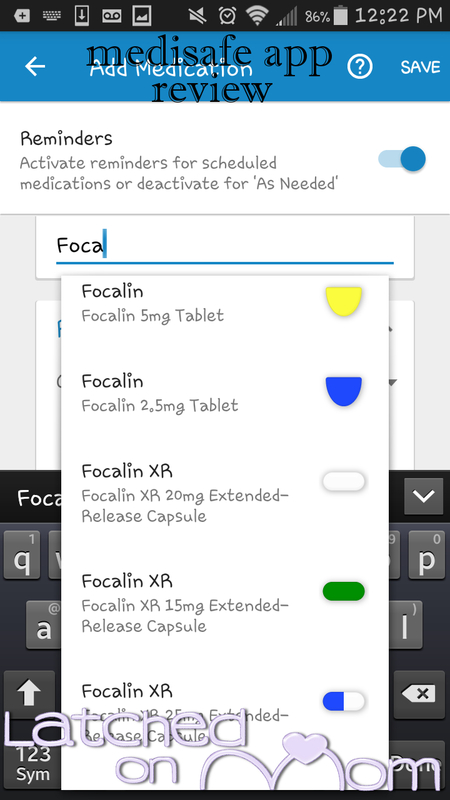 Type in their name and within the MENU, you can ADD MEDICATION. This part is great, very interactive. 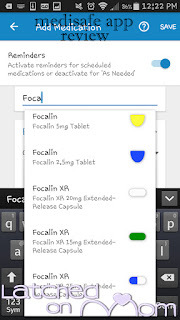 As you type, it will predict which medication it is and you can scroll with your finger down to find it. 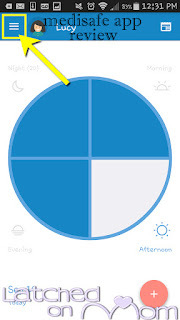 You can choose now the reminder times here- how many times per day, which time it's taken and adjust your schedule to every day, days interval- like every other day, etc. or to specific days like shown in the screenshot below. 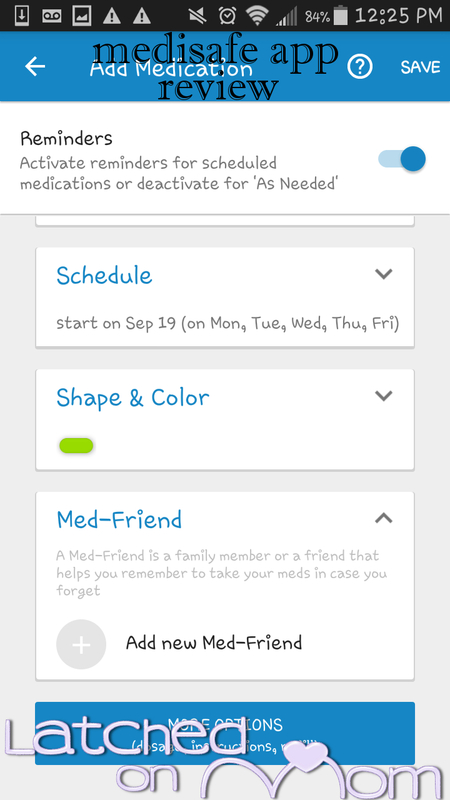 You can select the shape and color of your medication for identification as well. There is an option to add a MED-FRIEND. A med-friend basically is someone you add to help you remember to take your meds. You enter their name and number and email and if they log into the app, they'll be a member of your care team. This is a great tool for those who are independent but are sometimes needing a bit of motivation. 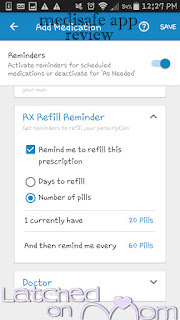 Another feature that is super handy is the RX REFILL REMINDER, where you can put in a reminder notification that it's time to get a refill. 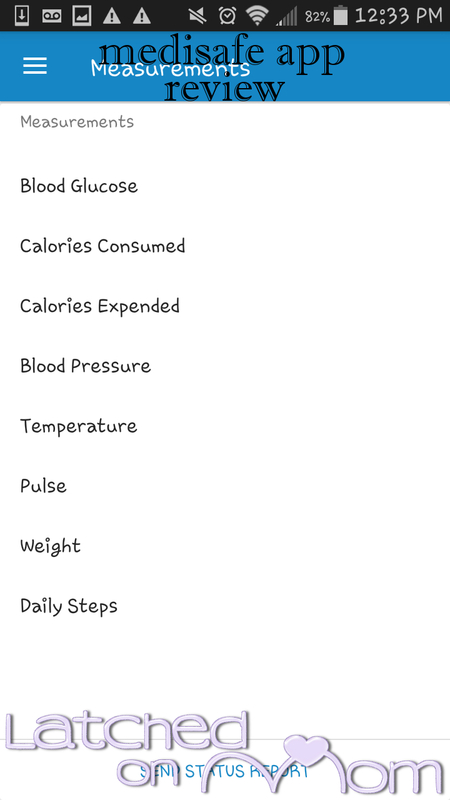 If you conscience of your body reactions day to day, or are monitoring a new medication, the MEASUREMENTS selection within the MENU will allow you to chart basic stats like temp, pulse, blood pressure, etc. This can be a big motivation in keeping on top of your health! Also, you can ADD A DOCTOR under the MENU, if the name and number is saved as a contact already in your phone it will pop right up as soon as you press the contact icon to the right of Doctor's Name. Keep track of appointments and share your status report with the doctor at a touch of a button. 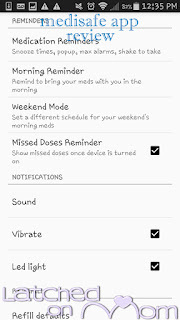 Under SETTINGS in the MENU, then GENERAL SETTINGS you can customize your notifications to fit your schedule and liking. 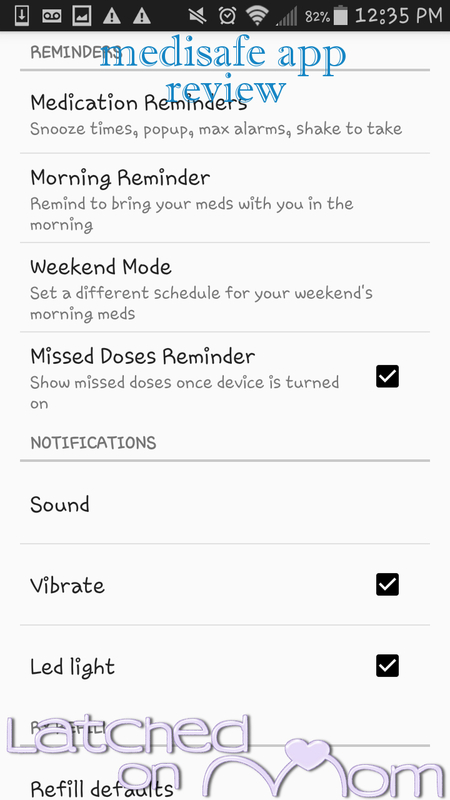 And if you ever have a change in dosage, schedule or are no longer taking a medication, you just go to MEDICATIONS in the MENU and click on the medication. At the top right of the screen there is a pencil icon, if you click on it you can edit the specifications. If you click the trashcan icon, it will have a pop up asking if you want to keep the history of this medication before deleting it. I love that this safeguards sometimes fat thumbs I have on my phone! You can find more information about the Medisafe App by visiting the Medisafe ABOUT section on the website HERE. Also, be sure to read Medisafe’s user story by David Julian in the LA Times and Medisafe’s user story from Grace Hayes on the Medisafe blog! 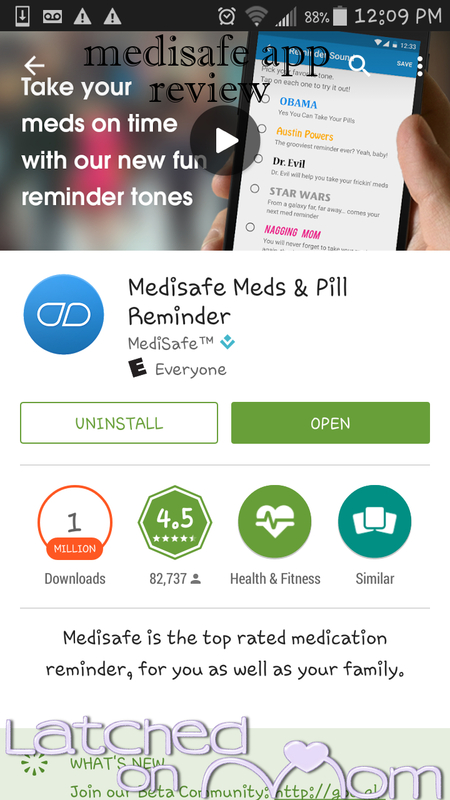 If you're looking for a user-friendly app to help you with your medications, I definitely suggest giving this app a try! Latched On Mom was given compensation in exchange for sharing my thoughts and experiences on this campaign. This post was made possible by Mom Spark Media. Please see my full disclosure for more information.